In 2003, the new government of Kenya kept their promise: to make primary education free of charge for children to age 12. This means that an extra 1.5 million children fo to school currently. This is of course a tremendous step in the right direction. Education gives children the chance to leave the slums. Some children bring their little brothers and sisters, even they are too young. School is a safe haven for them. classes of around a hundred children are no exception. Teachers do extra shifts and often double classes. One class starting early morning and the next in the afternoon. We aim to have classes of 35-40 children. In order to achieve this there is a need for about and extra 60.000 certified teachers. At the moment there are many uncertified volunteer teachers. There is also a shortage of buildings and materials. 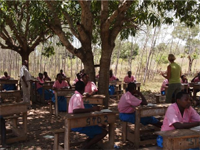 The education of hundreds of children often takes place under a tree. The aim of Stichting Wenzi is to improve education in Kenya. With your support we can provide furniture, educational material, better housing and especially professional teachers as well as secondary education for the poorest of the poor. The main outcome of Stichting Wenzi is the Education Fund that sponsors children at the end of primary school to continue with secondary education on a 50/50 basis: parents pay half of the education costs and Stichting Wenzi matches the other half. This way education is more affordable while people are also encouraged to generate funds themselves.